While reading an Education Week Blog by Jill Berkowicz and Ann Myers, The Importance of Challenging Our Comfort Zone (August 6), I was reminded of the need for school leaders, instructional coaches and teachers to create environments where staffs and students are comfortable with discomfort. I had the chance to work this past week with the New Jersey Education Association’s (NJEA) Priority Schools Initiative. Implementation teams from selected schools with a high need and strong desire to increase student achievement success gathered for two days of learning, examining and challenging current practices, and planning for change. This included central office staff, principals, association staff, local association leaders, and teachers. The program, in its second year, requires some conversations that create discomfort at times for everyone. The design of the program including retired teachers serving as coaches (funded by NJEA) to the implementation teams and in the school with staff creates an environment encouraging people to be comfortable with the discomfort needed for change. Teacher growth occurs (change occurs) at the conscious levels. The work of coaches moves teachers to consciousness or keeps them conscious as they practice a strategy which generally is uncomfortable for the teacher. 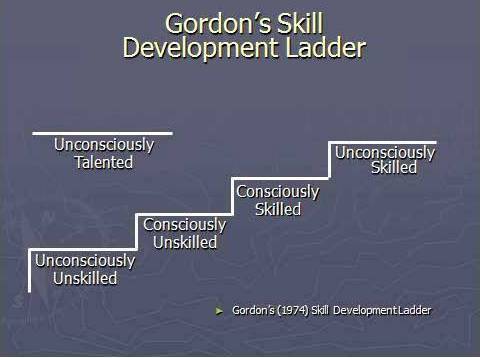 Anytime we are working at the Consciously Skilled level, purposely practicing, there is a discomfort. We often feel clumsy at this point. The two conscious spots are where growth and change occur. Coaches create discomfort. To be successful they also need an environment where the teacher is comfortable with discomfort. If not, the teacher withdraws from the change process. I would suggest that a major role of Professional Learning Communities is to create discomfort and comfort. When teams of teachers examine student work, data and assessment results, I suggest they look for something that brings them discomfort. Once we find discomfort with the current results, it’s on to creating a plan for getting the changes we want. Most often that means teachers changing what they are doing. (discomfort). Facilitating a PLC means helping create an environment for being comfortable with discomfort. When I work with teachers to identify student behaviors that they want to develop in order to increase student achievement, perseverance is most often on the list. They want students to struggle longer, start over, make another attempt. That means they need students who work through the discomfort of not being successful in their initial attempts at learning or problem solving. The teacher needs to create a classroom climate where the students are comfortable with discomfort. Effective cooperative groups often help with that environment. As this new school year begins consider what you will consciously do to create an environment for leaders, teachers and students that promotes comfort with discomfort.